Five of the top ten winners in prestigious high school science and mathematics competition are of Indian origin. 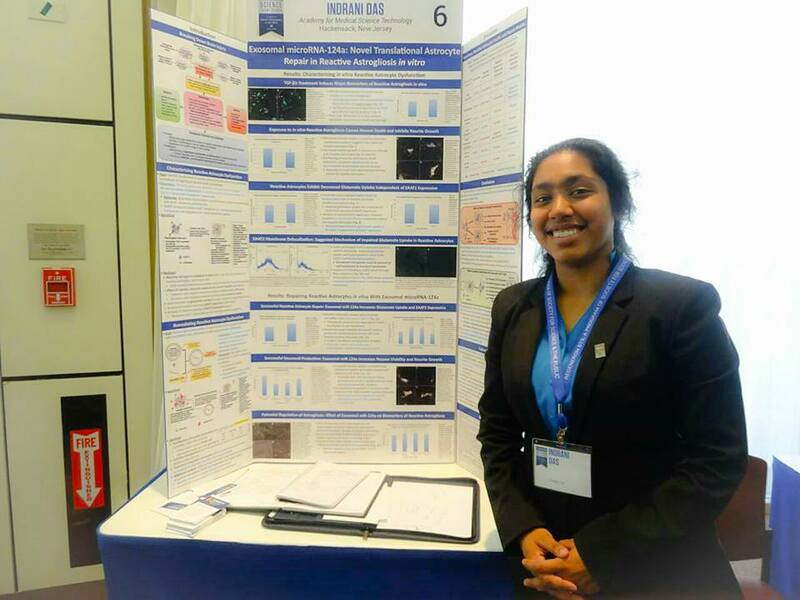 Das, 17, a student at the Academy for Medical Science Technology in Hackensack, NJ, won the prestigious high school science and mathematics competition for her new approach to neurological damage. “These diseases are so prevalent, so debilitating, it really matters to me that I continue to work on this,” she said after winning the top prize in Washington on March 14. The New Jersey teen said the purpose is to treat traumatic brain injury which can lead to stroke, Alzheimer’s or Parkinson’s diseases. “In all these injuries, there is an insult to brain tissue which on the one hand causes neurons to die, but on the other hand causes supporting cells to calm these neurons,” she explained. “In my model, I found one of the problems which is contributing to the disease condition and then I also helped to treat it”. She said that she has been working on her project for three and a half years. The second place of $175,000 was conferred on Aaron Yeiser, 18, a senior at Perkiomen Valley High School, Pennsylvania, for his development of a new mathematical method to solve partial differential equations on complicated geometries. In third place was another Indian American student, Arjun Srinivasan Ramani, 18, a senior at West Lafayette Junior-Senior High School, Indiana. He won $150,000 for blending the mathematical field of graph theory with computer programming to answer questions about networks. Das, Yeiser and Ramani were among 40 finalists who over the course of a week, March 9 to15, presented their innovative research projects to eminent judges, displayed their work to the public, met with renowned scientists, and competed for $1.8 million in awards. Winners of the top ten awards, ranging from $40,000 to $250,000, were announced Tuesday evening at a formal awards gala in the National Building Museum. 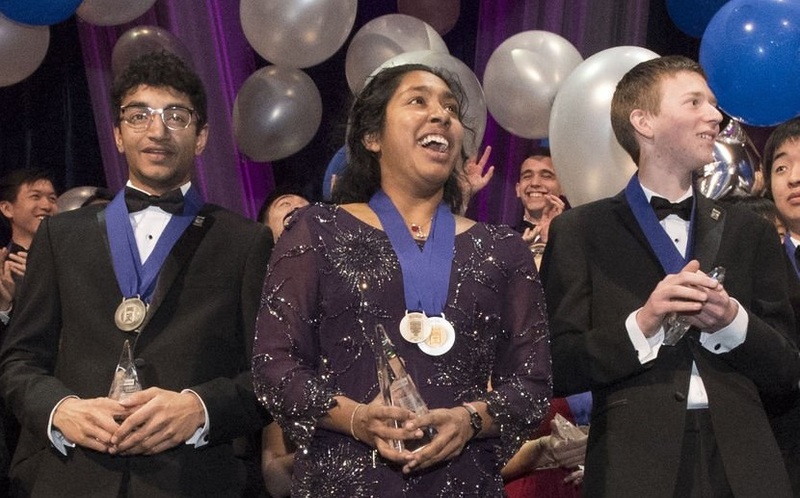 Among the other Indian American winners were Archana Verma, 17, in fifth place, awarded $90,000; Prathik Naidu, 18, in seventh place, awarded $70,000; and Vrinda Madan, 17, in ninth place which came with an award of $50,000. It’s remarkable that of the top 10 winners in this year’s competition, five or 50 percent were of Indian-origin. Furthermore, of over 1,700 applicants for the Regeneron Science Talent Search (Regeneron STS), 300 semi-finalists were selected each receiving $2,000 in addition to their school getting a grant of an equivalent amount. Of these “Top Scholars,” 40 finalists were announced January 24 of which 14 or 35 percent were Indian American students. These are mind-boggling statistics given that Indian Americans comprise a mere one percent of the US population. All the finalists exemplify and embody the best and brightest in America. Through science, they have attempted to tackle compelling issues such as fighting cancer and other life-threatening diseases, combating climate change and preserving the environment, among others. Ramani, the third prize winner, stated that his project is about network analysis, noting that the most common network is social media giant Facebook. “I basically developed an algorithm that can more efficiently generate a random network to compare it to the real world data,” he said. Asked how will this benefit society, Ramani replied that finding abnormal patterns could identify potential problems with our bodies including cancer, neurological disorders, among others. Noting that data is getting very big, he emphasized the need for more efficient patterns so diseases can be identified more quickly, and treatments found expeditiously. Verma, a student of Jericho Senior High School in New York, said that her project focuses on the chemistry behind energy efficiency. Among other factors, it examines what happens when light gets absorbed, and where does that energy go. About the potential benefit she mentioned integrating the solar cells into windows for a better solar energy source. Naidu, a senior at the Thomas Jefferson High School for Science and Technology in Alexandria, Virginia, developed a number of algorithms to identify new therapeutic targets for treating cervical cancer, leukemia and breast cancer. Naidu has been working on his project for nine months now and has started piloting his tool with the Massachusetts General Hospital. Vrinda, a student of Lake Highland Preparatory School in Orlando, Florida, discovered that current drugs are losing their resistance when it comes to malaria, a disease caused by a plasmodium parasite, transmitted by the bite of infected mosquitoes. Madan admitted her project has limited applicability in the US where malaria is very rare, “but in developing countries like India, Africa and those in South America, it will be a huge step towards eradication,” she said. The STS, a program of Society for Science and the Public since 1942, was formerly known as the Intel Science Talent Search (1998-2016) and earlier was supported by Westinghouse (1942-1997). Regeneron Pharmaceuticals, Inc., a leading biotechnology company headquartered in New York, took on the STS from this year when it will be giving over 3.1 million in awards. Founded by STS alumni and a true champion of science, the company has committed 100 million dollars in funding over the next decade. Throughout its 75 years, the criteria for selection in the STS have remained the same: students are chosen from across the nation for their scientific prowess and overall potential to become future leaders of the scientific community. Alumni of the program have made extraordinary contributions to science and are recipients of over 100 of the world’s most prized honors in science and math including the Nobel Prize and the National Medal of Science. The other Indian American finalists of the Regeneron STS were Sambuddha Chattopadhyay and Rohan Dalvi, Montgomery Blair High School, Silver Spring, Maryland; Krithika Iyer, Plano East Senior High School, Plano, Texas; Vineet Edupuganti, Oregon Episcopal School, Portland, Oregon; Apoorv Khandelwal, Tesla STEM High School, Redmond, Washington; Evani Radiya-Dixit, Manan Ajay Shah and Arjun Subramaniam, The Harker School, San Jose, California; and Jessika Baral, Mission San Jose High School, Fremont, California. Author: Geeta GoindiGeeta Goindi, a journalist based in the Washington, DC, is a Contributing Editor. She has been covering the Indian American community for more than a decade.